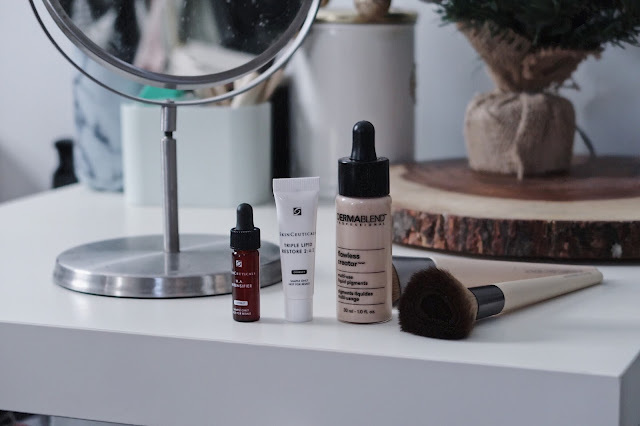 I posted this picture a while back on my Instagram and asked if anyone would like an in-depth review on these products and some were interested in the Dermablend Foundation; so here it is! 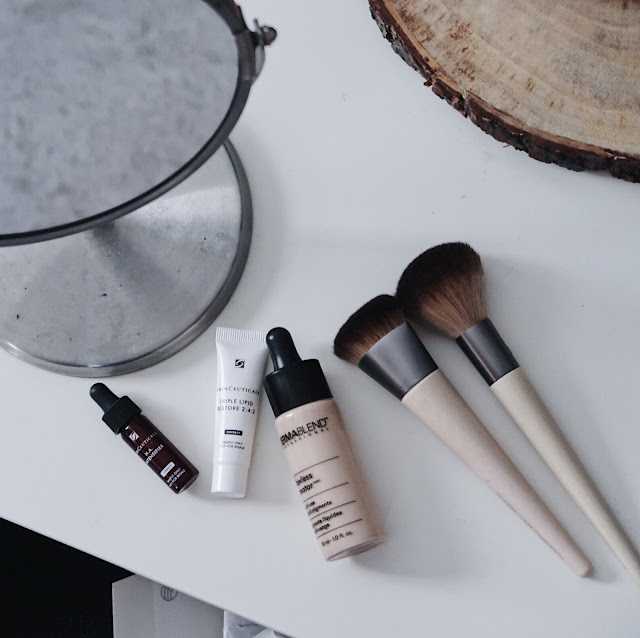 Pictured are all three products, but I'm only doing the review on the foundation. 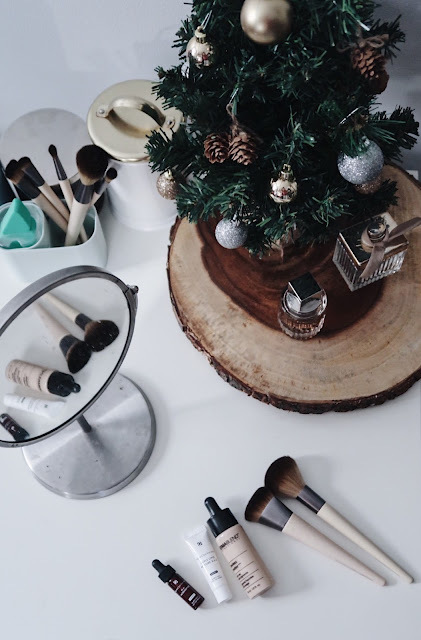 This is a foundation drop that can be used alone or mixed with your moisturizer. I tried it by itself and tried it with my moisturizers since I need as much hydration as I can get. 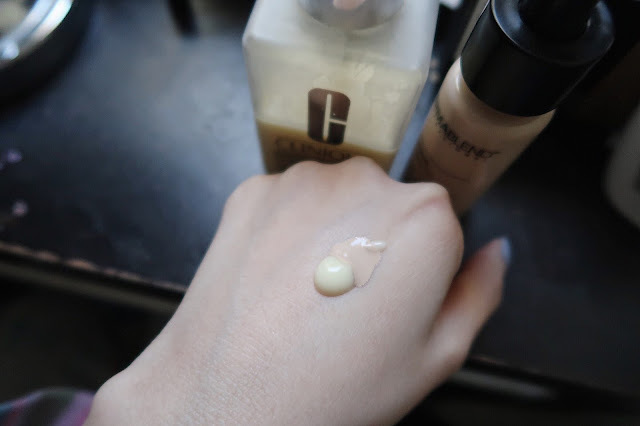 I had pretty high hopes on this since these types of foundations were really popular a year or two ago, and I never had a chance to try them until now. The packaging is very straight-forward and to the point. It has a dropper dispenser that allows you to use as many drops as you like - very hygienic. It is packaged in a glass bottle. It is a liquid formula. The consistency is watery. I do notice it separating in the bottle so it needs to be shaken before use. I have applied moisturizer before applying this foundation when testing it alone and in combination (foudation+moisturizer). By itself it was REALLY pigmented. This is a pretty full coverage foundation. The shade I got was too light for me, but I thought I'll try it anyway. I have dry skin and as you can see below, it definitely shows. 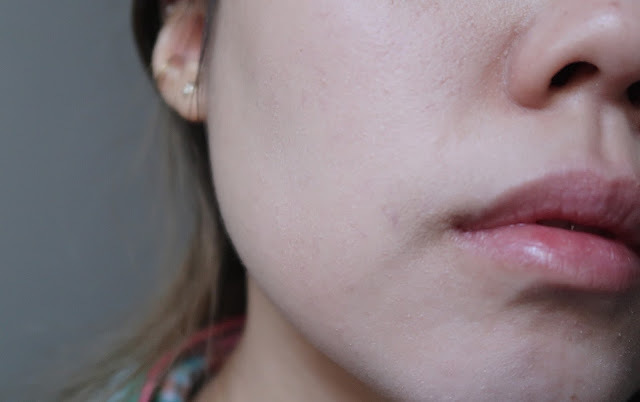 It also shows all of my clogged pores, blemishes, and lines that I didn't even know I had?? 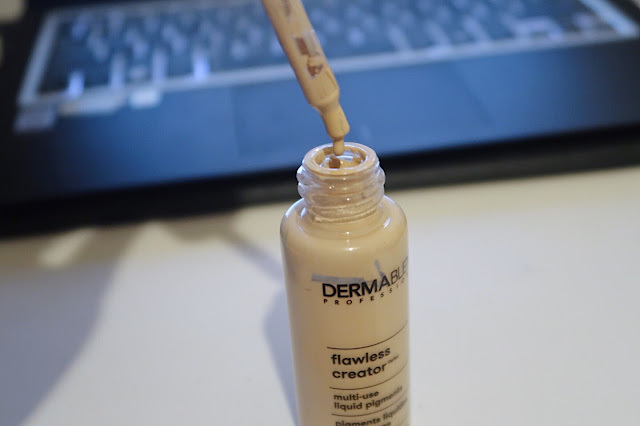 I have never felt so insecure after using a foundation until I tried this one. This foundation by itself definitely ages me. I also tried it with two different moisturizers. This is the part I was most looking forward to. I first tried it with the Aveeno Positively Radiant Daily Moisturizer SPF 15 which is more like a light sunscreen. It felt pretty thick - almost paste-like when mixed together. I have never mixed foundation and moisturizer together so I didn't think much of it. Application was interesting. It felt like applying lotion - thick lotion. I could feel the products on my face which I was not too fond of. I noticed that my face looked ghost-like (probably because the Aveeno was white) and "dusty". It wasn't cakey like when I tried it by itself. I thought it might be because my Aveeno was not hydrating enough or maybe because I applied with my fingers instead of a beauty blender so it didn't apply evenly. I decided to try again but with a thicker moisturizer and a beauty blender. 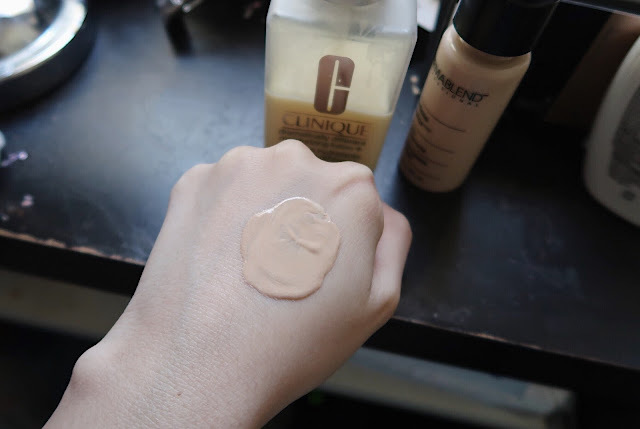 I used the Clinique Dramatically Different Moisturizing Lotion and the beauty blender, and I still had the "dusty" look! The foundation blended well with my moisturizers on my hand, but not on my face. I can still see the pigments itself on me once the moisturizer is absorbed. The main difference is that I get a dewy look when mixed with a moisturizer than by itself. I really like the concept of this, but I don't think it works for me. I'm a little bummed since it seemed like it would be perfect for people that has dry skin since we can mix it with our moisturizers, but think the formula may be too "watery" to be mixed well; it needs some "oils" to help hold everything together. 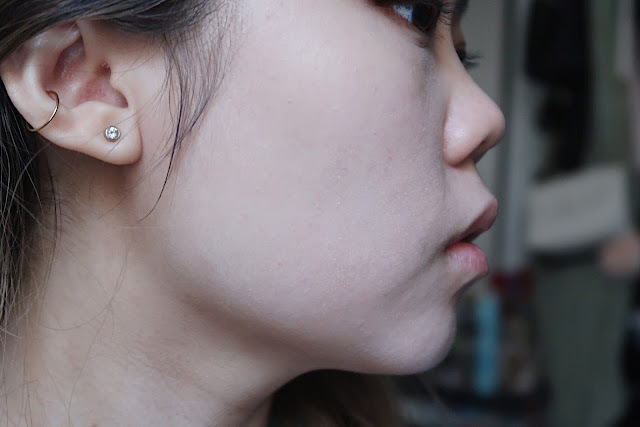 I actually think this foundation would work well for oily skin types. It has great coverage, and a little goes a LONG way. 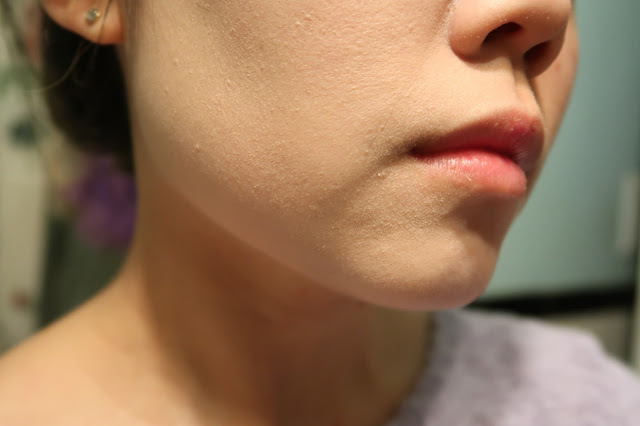 This foundation photographs beautifully from afar (like 3 feet or more), but in close-up shots or in person, it doesn't look natural on me. You can definitely tell I have foundation on which isn't the look I typically go for. I received these products for free to test and review. All opinions are my own.